As this week is Mental Health Awareness Week it seems appropriate to publish our first blog about a major healthcare branding project we have been busy developing over the last few months. Our client for this work is Maudsley Simulation, a division of SE London and Maudsley NHS Trust. The Maudsley Hospital, part of SE London NHS Trust has a long established and international reputation for innovation and excellence in the treatment of mental health. One of the areas where Maudsley leads the world is in their innovative approach and training offerings in their provision of ‘Simulation’ based training. ‘Simulation’ is ‘live’ scenario-based courses for health professionals and other public/private sector delegates who may come into contact with challenging behaviours from individuals during the course of their work. Simulation training involves the use of actors and hi-fidelity mannequins to set up intervention scenarios with participants engaged in active role play whilst the scene is video-linked live to the rest of the workshop participants to enable facilitator-led discussions and peer learning. The interface between physical and mental health is a key area of course content. The whole experience is fine-tuned to promote learning in attendees that translates into more positive outcomes in practice. The courses take place either at one of Maudsley Simulation’s sites or at their clients’ offices. The future will see an exciting purpose built Simulation Centre at the SE London and Maudsley NHS site in Camberwell. 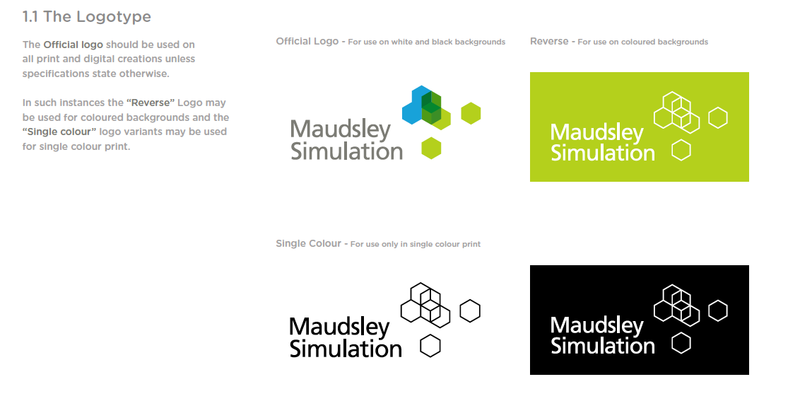 To further enable the marketing of the Maudsley Simulation brand both within and outside of the NHS, a need had arisen for the development of a separate brand identity. Design Incorporated were invited to tender a credentials pitch and based on our boutique team approach and combination of healthcare branding and broader branding experience we were successfully appointed. The project has been running over the last three months and the first stage is now complete – on schedule. Fine tuning colourways, typography and device size – subject to the required relationship with the NHS logo.